A pastry chef or patissier is a specialist member of a kitchen or restaurant and works in the production of pastries, breads and sweet items. The role is specialist one and requires technical skills in sugar work, chocolate work, different pastries and breads. A keen eye for detail and creative flair are important. The role may include ordering suppliers, deciding on menu's, researching and developing techniques, managing stock and training others. . Pastry chefs work in hotels, restaurants, private dining establishments, bakery, bistro's and other hospitality locations. Pastry assistants may learn on the job through an apprenticeship and can attend college or specialist school. Pastry chefs can go on to become head chef's, executive pastry chef's, open their own bakery or culinary school. 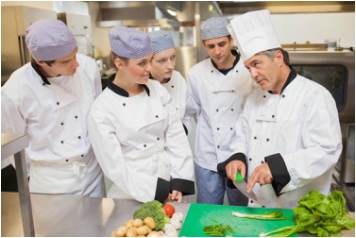 The demand for chef's is currently high.